This is definitely my favorite player companion so far. It gives you more new rules than any other player companion, and it somehow manages to do that without getting rid of the flavor. The new tiefling heritages are great, and there are plenty of feats, traits, and other goodies to customize your tiefling characters. Well done, Paizo! As the title suggests, the Pathfinder Player Companion: Book of Fiends is a book for the Pathfinder Roleplaying Game, it is intended for players, and it is meant to give more options and ideas on how to play a character of the tiefling race. That is, someone descended from fiends of the Lower Planes (devils, demons, and whatnot). The book succeeds admirably in this, providing an overview of what a tiefling's family life and upbringing will probably be like which is to say unpleasant, and their likely views on everything from the gods to violence to society. It also provides new subdomains for tiefling divine spellcasters, ten variants on the base tiefling depending on who and what your fiendish ancestor was, new spells, new feats, and a raft of traits that give minor bonuses while helping to both connect your tiefling to the campaign setting and to establish their character, and much more. This is an amazing piece of work for the price listed and a very worthy addition to any Pathfinder player's library, especially for fans who want to try something different from the usual elves and dwarves and halflings. 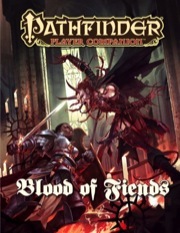 I've posted my ENWorld review on Blood of Fiends HERE. Blood of Fiends is an invaluable resource for anyone playing tiefling characters. It expands on the tiefling article featured in Council of Thieves #1: Bastards of Erebus, providing no less than 12½ pages of fluff that brings great detail to tieflings in Golarion as opposed to the 3 pages of fluff presented in the aforementioned article (not counting the article's Random Features table which is also present in Blood of Fiends). In addition to the expanded fluff, the book features a bunch of game mechanics, some of which were included in the Council of Thieves article as well. The variant tiefling heritages are more detailed in this book, providing descriptive text and awesome portraits showcasing a sample version of each heritage. One of the feats presented in the Council of Thieves article, Fiendish Heritage, has been ommitted from Blood of Fiends. So if you want a variant heritage for your tiefling character, just choose one. Don't bother with the feat. Overall this is a great player resource with lots of useful fluff AND crunch. Some of the material has been presented before, sure, but that was as an article in a primarily GM-focused product. Blood of Fiends presents all the information players need to play tiefling characters without having to borrow their GM's book. Artwork is, for the most part, phenomenal. Just announced for April! The cover image is a mockup, and will change prior to publication. Now that's a book I've been longing for a loooong time. Awesome, now if only there was one for Aasimar. I want an Aasimar version as well. They haven't announced any products after this in the line. I would expect it will show up sooner than later. Hmm, I would have thought the article in The Bastards of Erebus would have been enough, but this is cool too. I hope it gives examples of tieflings who do more than simply respond to their stereotype. Too many PC's and NPC's are either mustache twirling villains or textbook good guys. Its too easy to simply fill in the Tiefling Character Background Mad-Lib and call it a day. This looks like it's going to be very good indeed. Hopefully we'll get even more detail on the differences between tieflings of various fiendish ancestries, daemons and oni and kyton and the like. I take it the reason this is not named "Tieflings of Golarion" is marketing? Yet not all tieflings succumb to the sinister compulsions of their evil blood—some strive to rise above the stereotype and become heroes in their own right. This is really good to see after missing that treatment in the orc book. Really glad there's going to be real support for non-evil tieflings in this book. This book explores all that it is to be a tiefling, including not only an extensive discussion of tiefling culture and society, but also presenting numerous variations on the standard tiefling character. And this has me really hopeful for the Aasimar book if it can answer that level of range, especially if this book outdoes the tiefling article in Council of Thieves! Cool to see support for non-evil tiefers. And on that note, oddly enough, I've never actually played an evil tiefling (just CN/CG). I am sure an aasimar book is going to show up sooner or later now that this is here. Varaint Tiefling like the article in Council of thieves but hopefully more than a reprint. Definitly like any new options for Sorcerers and most other classes as well. Wow, cover art is actually awesome. Too bad it's a mockup. I would love a Fey type race that part human like Assimar, Tieflings, Dhampirs, etc. Tiefling: "I can cause fear, or have a bite, or claws or other spells... what do you got?" Aasimar: *glows in the dark"
Yeah, I guess the tieflings deserve a book of their own. Have to say I'd prefered some more regional companions and one for the aasimar first, though. I like the irony that WotC and Paizo prefer that the PC be good aligned, but they have a ****load more options for Evil characters... Most worlds/campaign settings seems to be overun by evil outsiders, where are the good ones? Tiefling by default are not evil. Some might lean that way more than good but they are not evil just because. As for the more evil options in varies books. Well there needs to be more. In a average campaign a player has one maybe two characters. While the group might face untold numbers of monsters and evil NPC's and having a wide range of options to make each one stand apart from others helps keep things fresh. So to me it isn't ironic, to me it just makes sense. Good people who misunderstand you and/or are doing good for their side while you're doing good for your. Good aligned being who are quite the sinners. Seriously, I think Many of the NPC/monsters follow different alignment rules than the PC. I think the problem is when that ratio also applies to books meant for players. That's what had me so disappointed with Orcs of Golarion. It didn't really have anything for players that wanted to play good orcs. No support, in fact it went out of its way to discourage them for the vast majority of the book. This is really a problem in the fluff of Pathfinder which is actually reflected in player stats as well. I mean, compare all the Fiendish lords (Demon lords, Archfiends, the Horsemen) with the Empyreal Lords, or compare all the options evil characters get with the options good characters get. Yeah evil does get a lot of options and good gets some but what about law and chaos? I suspect it's an artificial artifact of observation—if you were deliberately looking to build an evil character, I suspect one might think the good guys got more choices than evil does. The grass is always greener, as they say. I do wonder how many options there are for good characters that don't have an equal but opposite option to support evil? The range of prestige classes might be weighed toward good but I doubt it (the core rulebook has an evil prc but no equivalent good one). I don't know. For someone who has been trying to make certain kinds of characters for a long time now, the disparity really does exist. We have devil-themed martial arts in the setting material but no celestial-themed martial arts. We have evil Qinggong powers but no good ones. There aren't any good-aligned gods or Empyreals that represent the "Dark Is Not Evil" theme. Orcs of Golarion really didn't have much of anything for people that wanted to play good orc characters and in fact went out of its way to discourage them. (Goblins of Golarion at least offered support for good-aligned goblin players) If anything it just favored those players that want to shove "genocide is the only option" down everyone else's throats, which really stung considering it was supposed to be a book for people that wanted to play orc characters. Anyone else find it ironic that the mockup cover for the book on tieflings shows an evil aasimar? The joys of mock up covers! Although to be fair, that particular aasimar DOES have fiendish blood in her, to a certain extent. She is an evil Aasimar with fiendish blood? I'd give her some of my fiendish "blood". So there are seven race books, and two of them lean towards evil. There are two good faith books and one evil faith book. Every character option doesn't have to have an equal parity for the other side. But looking at a few narrow places of disparity seems to be ignoring the tons and tons of good-aligned character options out there. Edit to add: Even Orcs of Golarion isn't that bad. Most of the feats do require you to be non-lawful. But that doesn't mean they have to be chaotic evil. If you want to make a chaotic good half-orc barbarian, there are tons of options you can take. Of the spells included, only one of them is actually evil. The religion traits are all for the evil orc gods, but where else are they going to be defined? If you want to play an orc cleric of Sarenrae there are already traits for her worshipers. A lot of the other race books copped to the fact that there are numerous evil examples of those races and had flavor support for them. Halflings and their extremist "protecting their own kind" evil-leaning faith for example. The orc book didn't have anything like that breaking away from the CE stereotype, while the other races got more range. The good faith book has no support for darkness/scary-themed deities. And this isn't me intentionally looking for disparity. I actually do want to play a holy barbarian and a holy monk and a good servant of some genuinely good darkness-themed deity and a good orc that doesn't suffer from Drizzt Syndrome and has some cultural flavor to pull from that isn't based around being a complete monster. I've been wanting to play them for a long time and have been frustrated for just as long. I guess we just have to come to the logical conclusion that James Jacobs hates orcs and half-orcs and doesn't want anyone playing them ever(just look at the players handbook. No half-orc iconic among any of the base classes). I guess it's because the first Forgotten Realms novel I ever read had a good-hearted orc and bugbear in it that has made me attached to them and feel not all of them could be evil. But in Golarion they are, no questions asked. The Iconic Inquisitor is half-orc. Is the Inquisitor in the APG? Have we had a Meet the Inquisitor blog post yet? There was no iconic half-orc in the PHB. That basically says "this race is an afterthought". And it's not even like the half-orc Assassin has an iconic character behind him, he's just a member of the gutted, basically worthless Pathfinder conversion of the class. Anyway, I'm eager to see this book, and the one for aasimar, and hopefully the third in the series for the elemental planetouched as well. There's a pretty good reason why we didn't put a half-orc into the first batch of iconics: half-orcs look like monsters. Like it or not... they do. That's actually what I suspect a lot of half-orc fans like about them; they get to "play the monster." Alas, that also means it's hard to use them in art, since it looks like two monsters fighting each other rather than a monster fighting a hero. To be fair: A) James Jacobs wasn't the only person involved in the iconics creation process. B) The core iconics were created before Paizo even realized they would be making their own RPG. By the time the decision to make Pathfinder RPG happened, the iconics were already too popular to change. I always thought you should replace Sajan with a Half-Orc Monk. Such an atypical combination would make for a cool character... in fact, I think I have a character sheet to go fill out. Honestly... had we known we were going to do our own game (and we actually knew that a lot sooner than the rest of the world did, of course), I suspect our iconics would have still ended up looking the same.